You are currently browsing the tag archive for the ‘Eco-tourism in Japan’ tag. Japan has been in the negative spotlight over whale-catching activities, however, what is relatively unknown is that whale-watching is also an eco-tourism business that is growing and showing tremendous potential, especially since Japan’s eco-tourism is still under-developed compared to that in other developed countries. Away from the headlines and negative publicity over Japanese whaling activities, some coastal communities in Japan have been moving in the opposite direction and have started or are starting to run whale-watching tours. There is a great diversity of whales and dolphins to be spotted in Japanese coastal waters: humpbacks, sperm whales, bottle-nose and spinner dolphins to mention but a few. Following the model of other nations, in supporting the local whale-watching businesses, we would be supporting a viable economic industry and creating more opportunities and raising the stakes for whalers to convert their operations to preserve the whale population instead of reducing it. Since a positive growth in conservation and protection of whale species is diametrically opposed to whaling which depletes the resources, supporting this local industry and local conservatism is a better option creating pressure from within the nation, than by negatively boycotting Japan on account its whaling bad press(see Whales and Dolphins: Cognition, Culture, Conservation and Human Perceptions). We would also be supporting educational activities, and creating in the nation a greater awareness and fostering a love in local coastal communities for the ocean’s most majestic creatures. While the Okinawa-Ogasawara islands’ whale-watching activities have established a reputation as the world’s greatest lookout for humpback spawning grounds(see my earlier post for details), off Kuroshiocho port on Shikoku Island are lesser known whale-watching grounds that can actually hold its own. Dubbed “the Mecca of whale-watching tours” by Rough Guides … the tours see an 85% success rate for whale-spotting (see Whales and Dolphins: Cognition, Culture, Conservation and Human Perceptions) Being closer to both Tokyo and Osaka, there is potential for eco-tourism to grow. 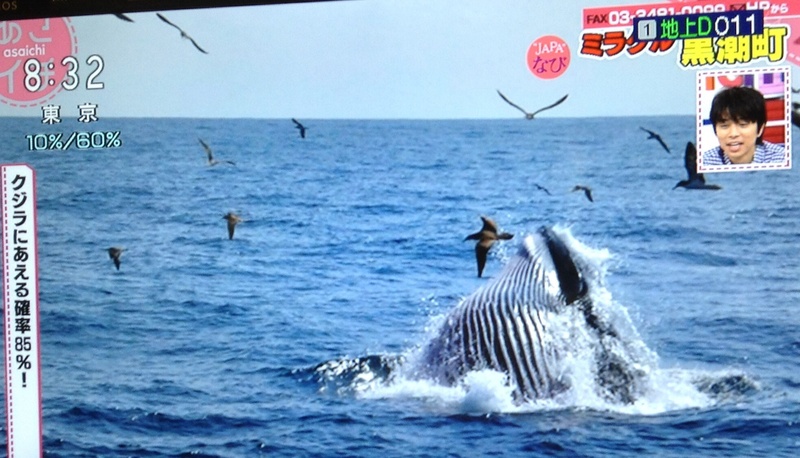 Read about Gail sensei’s whale watching trip in Kochi’s waters at her Lost in Transition blog. It’s said that the whaling industry in Kōchi dates from 1591, when the local daimyō Chokosabe Motochika gifted the warlord Toyotomi Hideyoshi in Ōsaka a whale and in return received eight hundred bags of rice. Japan and whales have, in recent times, become a controversial combination, but along Kōchi-ken’s coast few are complaining, as whale-watching tours are replacing the old way of making a living. Tours typically last three hours and cost around ¥5000 per person in small boats holding eight to ten people. The best time to see whales is May and August, though the season runs from spring through to autumn. Nothing’s guaranteed, but with a good skipper expect to see the large Bryde’s whales and medium-sized false killer whales, as well as schools of white-sided and Risso’s dolphins. For details, contact the Ōgata Town Leisure Fishing Boats Owners’ Association (tel 0880/43-1058, URL: http://www.sunabi.com/kujira) or Saga Town Fishermen’s Association (tel. 0880/55-3131). You can take Whale Watching trips from Katsurahama near Kochi City on Shikoku from May to September (Source: insidejapantours) The eco-tour boats depart from ports, not off the beach. 1) Urado Port in Kochi City. 3) -Takaokagyo Port in Muroto. Except for the typhoon season, it is very likely that you will be able to see sperm whales up to 15 meters in length in the waters off Muroto. Schools of dolphins are also a common sight. 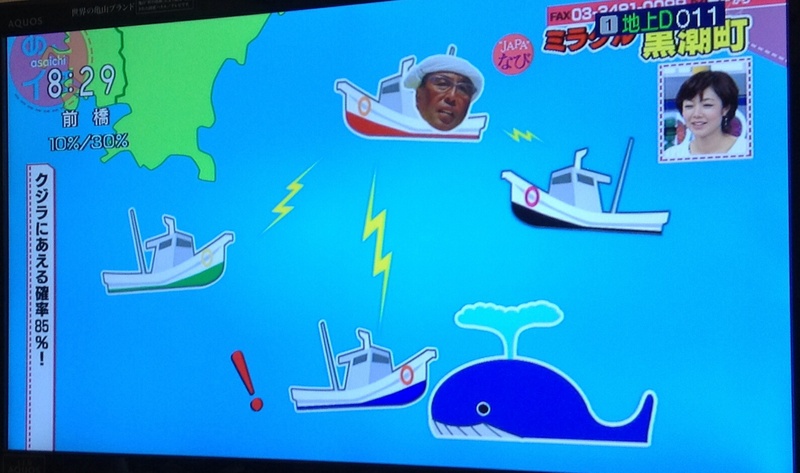 * You can see different whales from different ports. 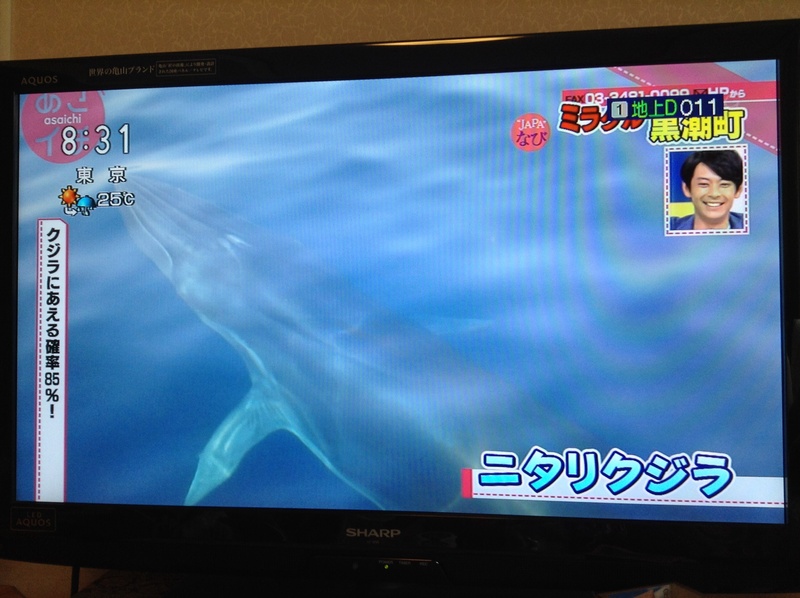 Muroto Port offers the chance to see sperm whales and grampus dolphins. The other ports have grampus dolphins and Bryde’s whales. Combine your eco-tour with one of Cape Muroto, located at the eastern end of Tosa Bay, is a designated Muroto-Anan Coastal National Park. 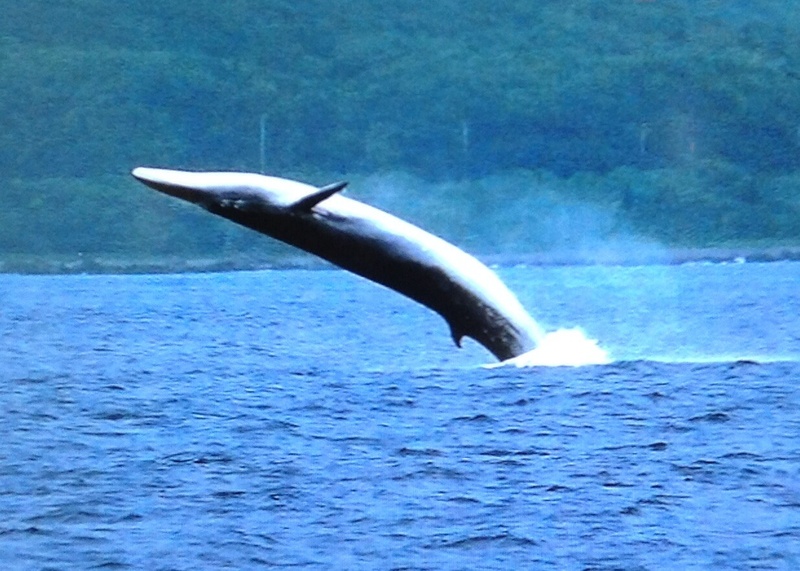 Muroto boasts whale watching and boat tours. Except for the typhoon season, it is very likely you will be able to see sperm whales up to 15 meters in length. Schools of dolphins are also a common sight. 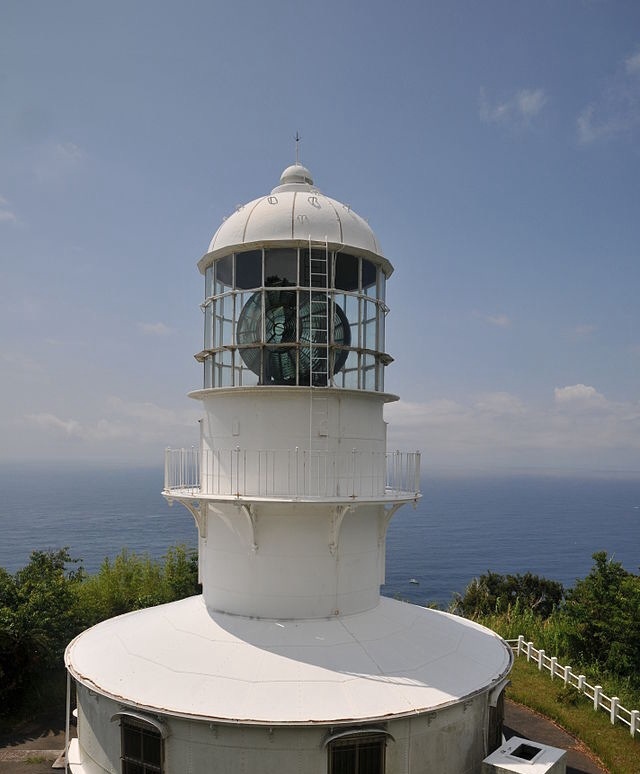 The symbol of Cape Muroto is the white lighthouse, which stands on the tip of the cape 155m high, with a lens measuring 2.6 meters in diameter. Built in 1899, it is Japan’s largest lighthouse and still functioning, it can be seen 56 kilometers offshore. It has offered protection to countless passing ships during the past 100 years of its operation. At the tip of the cape is a walking course, which winds its way 1.4 kilometers through the boulders that lie along the coastline. A recent addition to Muroto’s many charms is Deep Sea World. Taking full advantage of the area’s scenic beauty and the deep seawater that flows 200 to 300 meters below the surface of the ocean, Deep Sea World boasts a series of facilities focused on reducing stress and preventing illness. Not just the usual seaworld theme park attractions seen elsewhere, Muroto’s sea resort was opened by Shu Uemura, the world-famous makeup artist, and is famous for the thalasso-therapy (deep seawater treatments) that offers promising health benefits (see Japan’s deep-sea spa). For historical buffs, near the lighthouse, visit the historic Hotsumisakiji temple, a Buddhist temple of Shingon Buddhism, founded in 807. Built at the level of about 165 meters, it was popular with mountain ascetic monks, and is associated with Kuukai or Kobo Daishi. Kuukai (774-835), founder of Shingon School of Buddhism, started to do ascetic training in the deep mountains at the age of 19. Kukai according to local tradition, stayed around Cape Muroto as part of his training. He was living in a small cave near the sea (the cave is called “Mikurodo”, and is near the national road). According to legend… one day, in the midst of hard training, a bright star flew into his mouth. It is said that he reached enlightenment at that time. To visit this temple, you must climb a sloping trail from the cape and there is a trail to the lighthouse from this temple. [Air] 1h 20 min from Haneda to Kochi Ryoma Airport, and 40 min from the airport to JR Kochi Station by bus. [Rail] 3h 20 min from Tokyo to Okayama Station by JR Tokaido-Sanyo Shinkansen Line, and 2h 30 min from Okayama to Kochi Station by JR Seto-ohashi Dosan Line. 2h 30 min from Kochi Station to Cape Muroto by bus. [Air] 40 min from Itami or Kansai International Airport to Kochi Ryoma Airport. [Rail] 40 min from Shin-Osaka to Okayama Station by Shinkansen. The longest established organisation is the Ogasawara Whale Watching Association (OWA). Ogasawara is a cluster of 30 small islands (only two of which are inhabited) 1000 km south of Tokyo, which are rarely visited by non-Japanese and are only accessible by overnight ferry from the mainland. The OWA has been operating for nearly 20 years, and has its own code of good practice to minimise disruption to the animals. Dolphins can be seen in these waters all year round whilst humpback whales are present from mid-December to the end of April. As well the Ogasawara Islands Destinations other destinations with whale watching opportunities include from Choushi in Chiba prefecture in November and December and Shizuoka, both within easy reach of Tokyo, from April to October, from Kushimoto on the south coast of Wakayama Prefecture (convenient from Kyoto or Osaka), Kochi on the south coast of Shikoku and the Okinawa chain of islands.